"For as long as he could remember, Eli Edward Earnest had dreamed of being a chief of chocolate...a captain of cocoa...a chocolatier." 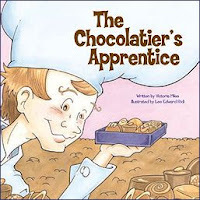 from: The Chocolatier's Apprentice; Echo Memoirs, 2007. Talk about a plum assignment. Last year, Purdy's Chocolates in Vancouver was looking for a unique way to celebrate their upcoming 100 year anniversary and support a charitable endeavour at the same time. In collaboration with the company Echo Memoirs, they came up with the the idea of a children's book, and illustrator Lee Fodi and I took it from there. Pounds of chocolate were consumed in the process, but you do what you have to for a story. I'm pretty sure I sampled everything they make, a few even plucked (with permission) fresh from the conveyor belt. And I had a wonderful time with the Purdy's people, who inspired, from their own experiences, many of the scenes in the story. Eli stacking four thousand pounds of peanuts? That was chocolatier "Todd" of Todd bar fame. Eli's technique for eating a chocolate cream? That came from Purdy's owner Charles Flavelle, head of the family business. But Eli's chocolate fairy? Okay, that was all me.